…a difficulty in imagining what it is like for someone else not to know something that you know. The better you know something, the less you remember about how hard it was to learn. …The curse of knowledge is the single best explanation of why good people write bad prose. It simply doesn’t occur to the writer that her readers don’t know what she knows—that they haven’t mastered the argot of her guild, can’t divine the missing steps that seem too obvious to mention, have no way to visualize a scene that to her is as clear as day. And so the writer doesn’t bother to explain the jargon, or spell out the logic, or supply the necessary detail. The key is to assume that your readers are as intelligent and sophisticated as you are, but that they happen not to know something you know. 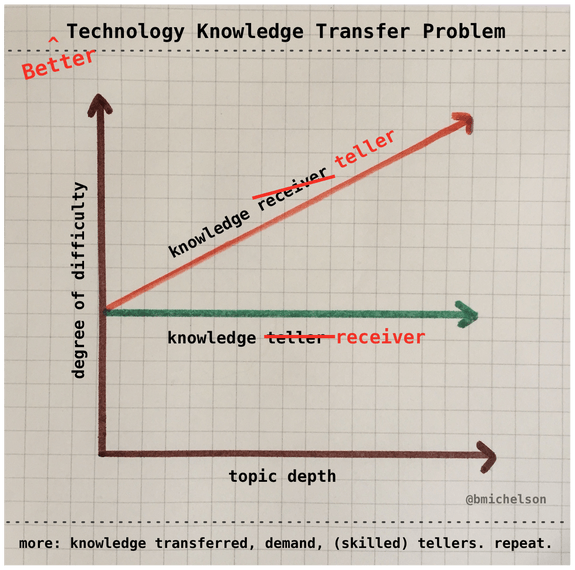 In other words, the communication burden needs to be placed on the knowledge holder, not the receiver. It’s also where my journey began, because I started to notice the use of comics to explain complex topics to the rest of us. Not infographics or one-pagers, but full books taking on topics across arts, humanities and STEM. I was intrigued. I read books on topics both familiar and not. Each book taught me something on visual communication, storytelling/narrative and curse free explanation techniques. As a plus, I learned a bunch on new topics in a fun, engaging manner. 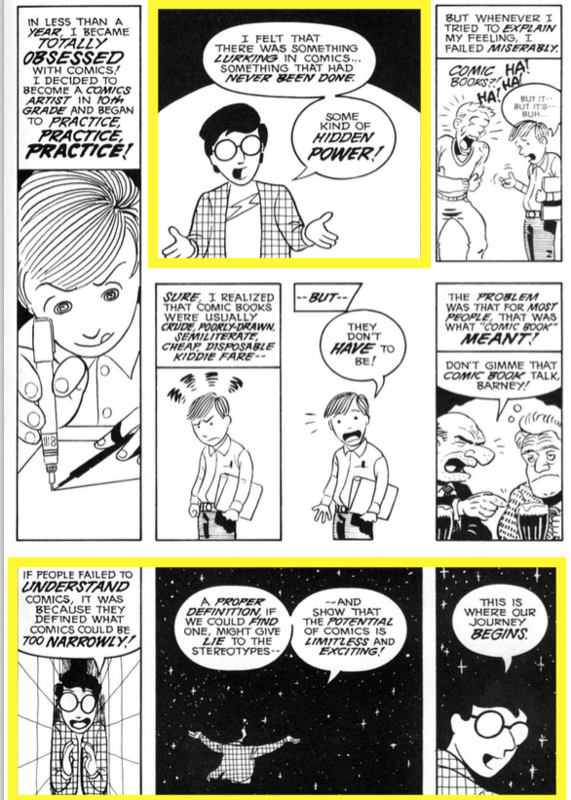 And yes, I’m tinkering with comics/graphic narrative in my explainer work. I think best with a marker in my hand. Always have. My workspace, and all paths to and from it, are littered with box and line diagrams, doodles, code snippets, and my (at that moment) best idea ever, on any scrap of paper, notebook or whiteboard within reach. Quirky, my friends think. But, I’m far from alone. Especially in the software field. In the wonderful Software Design Decoded, 66 Ways Experts Think, an early section is Experts Sketch. Experts sketch when they think. They sketch when alone. They sketch in meetings with colleagues or clients. They sketch when they have no apparent need to sketch. They sketch on paper, on whiteboards, on napkins, in the air. Experts know that sketching is a way to interact with their own thoughts, an opportunity to externalize, to examine, and advance what they have in their minds. …Experts draw a diagram, then draw it again, and perhaps again and again. Experts repeat these activities because they know that, each time they do so, they must re-engage with a fresh mindset and re-explain to themselves or to others. Variations in how they engage, think, draw, and communicate, as well as variations in what they choose to focus on, uncover new issues and opportunities. Experts ask themselves what would happen if they remodeled what they have in a different notation, using somewhat different modeling concepts or somewhat different semantics. Differences in expression can prompt them to consider additional issues. Beyond sketching, Software Design Decoded covers simplification, non-linearity, collaboration, uncertainty, fear and more. If you are curious how your practices match with, or can be expanded to, expert levels, pick up this book. And if you work with a manager that doesn’t get your seemingly random, casual, exploratory approach, drop a copy on their desk.